Aurora_b's Web Diary - Good Progress, but it feels like winter again! Title: Good Progress, but it feels like winter again! 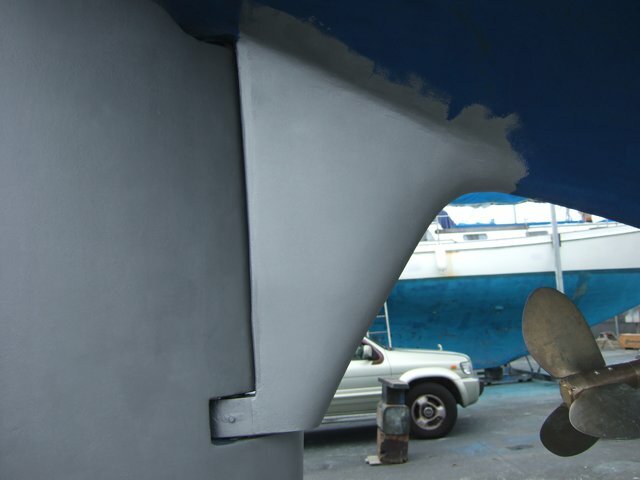 The ongoing work on the skeg has finally been completed and we're now preparing to antifoul the bottom. The first coat of primer, on the skeg and other parts that need priming, went on at the weekend which was encouraging, and antifouling proper should have been underway this week. But the weather hasn't played ball - it's been wet and miserable all week so far and they're forecasting more heavy rain for the rest of the week! So no painting until the weekend at the earliest. We have 3 different types of antifouling and need 6 good days to do it - 3 days for the antifouling on and just below the waterline and 3 days for the line above it and the bottom of the boat beneath it (as they're separate areas they can be painted at the same time).There was a slim chance that we might get back in the water before Christmas, but it's looking unlikely now. The boatyard travelift (that cranes boats in and out of the water) shuts down for 2 weeks over Christmas, so we hope we'll be ready as soon as they return to work, in 2012! While waiting for the paint to dry there's plenty of other things to get on with. 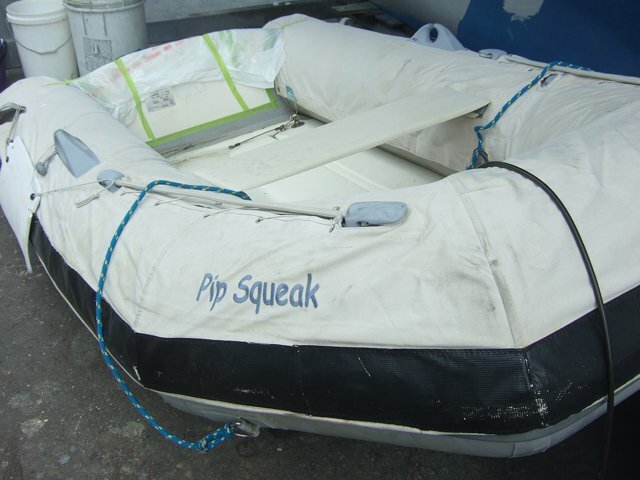 The dinghy's been lowered from the deck, taken out of it's bag and pumped up for the first time since February. So far the air is staying in it, which is a good sign! It's a rib, so glassfibre with a hypalon tube round the top, but it does have a wooden transom that will need to be repainted. 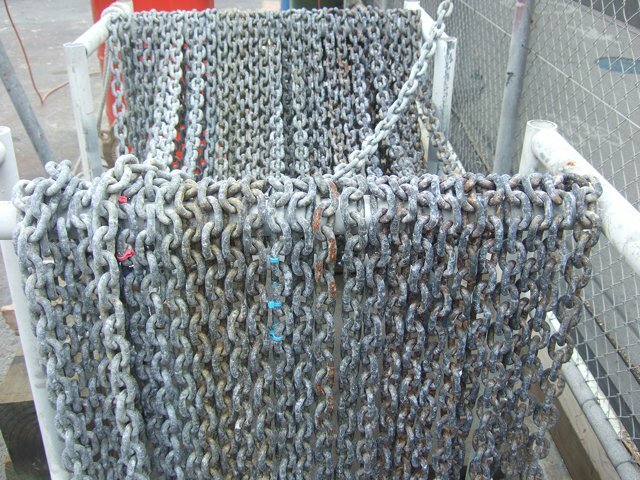 And then there's the anchor chain to maintain. 300ft of 10mm chain (a right imperial/metric mix) and about 85% of it is fine. The galvanisation on the remaining 15%, which is scattered throughout the whole length, is in various states of depletion - in other words, rusty! It's the result of anchoring with the chain lying over coral. We aim never to anchor in coral, but in a few places there was no option, and even if anchoring in sand, it is not always possible to ensure the chain doesn't cross coral at some point. As the boat moves in the swell and wind, so the chain will rise and fall and move around on the sea bed, and if any links are on coral the galvanisation is quickly rubbed off. Once back in the chain locker it soon starts to rust. So the rusty links need to be wire brushed, painted with a chemical that treats the rust and regalvanised. It is possible to get the whole chain regalvanised professionally, but our chain is high tensile chain (quite a bit stronger than normal chain) and there are reports that the regalvanisation process can make it brittle - not something we would want to risk! Then there's the basin taps to replace (bought in 2005 and carried halfway round the world! ), the green (solar, wind and tow) generators to rewire (found that full lock on the wheel is squashing the wires, and we need to wire up our new solar panel) - the list goes on, but it is good to be able to get on and fix things that we've wanted to do for months, if not years. 'Learning the ropes' is literally quite a challenge on Aurora B, and while the skeg work has been going on, we've added one more. On a night watch on one of our longer passages, and with nothing better to do, I counted the ropes we have to control the boat when fully rigged, and it came to 42. So now we have 43 (so it's no longer the answer to life, the universe and everything!). The new addition is a dedicated trysail halyard. For the longer passages the trysail (storm sail) is hanked on its dedicated track at the bottom of the mast, but if we want to hoist it, I have to climb quit high up at the mast to undo the mainsail halyard before I can attach it to the trysail. Generally when thinking of setting the trysail, the conditions and sea state are such that the last thing I want to be doing is climbing high up anywhere. Hence a dedicated halyard that's always attached, and it's bright yellow to make it easier to identify on a dark and stormy night! the bearing will last a lot longer and we won't have to take the skeg apart again for a very long time! Just a few links to check!